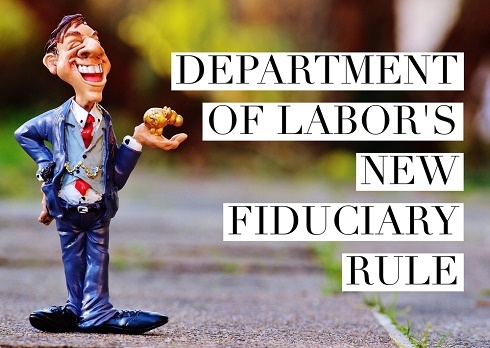 Labor Department's New Fiduciary Rule: What Does It Mean for You? Expands the fiduciary standard to cover anyone who offers investment advice involving retirement plans - 401k, IRAs and other qualifying retirement plans. Does not cover after-tax investment accounts - even if it is earmarked for retirement spending. Aimed to discourage abuse by investment advisers. If an advisor sells you a high fee investment product when an equally performing investment with a lower fee exists, you can now sue. Estimated to save investors $17 billion/year in exorbitant fees. Effectively bans commission-based investment products - unless the advisor and the client agrees to a Best Interest Contract Exemption (BICE). Takes effect April 10, 2017 with a transition period until January 1, 2018. We've all heard of cases where someone's financial advisor swindled them out of their entire nest egg - an awful situation where none of us want to find ourselves in. This rule aims to prevent those cases by providing some legal "backbone" for the consumer. Requires more disclosure and transparency on the part of the investment advisor to the investor. Transparency - almost always a good thing. Increased costs for financial advisors and companies selling investment products that may be in a 401k, IRA etc. - a necessary byproduct of new legislation and its compliance requirements. The investment companies won't just absorb the increased costs. This will almost certainly be passed down to the investor - leading to increased costs for you. While well-intentioned, the new rule is unlikely to prevent the truly rotten apples. Just look in our own industry, we have every incentive and legal obligation to put our patient's interest first, yet we still have Dr. Farid Fata. DOL's new fiduciary rule is welcoming news to the individual investor. While it won't prevent every single case of abuse, it will discourage those less scrupulous financial advisors from taking advantage of their clients. Sure you will likely have to pay a higher price for that advice due to higher compliance costs, but that may be a small price to pay for peace of mind. Investment companies aren't just going to take the new rule lying down, there are already bills being pushed through Congress to kill the new rule. If you are in the financial advice business, fasten your seat belts - the ride is about to get bumpy.